Using the Da Vinci robotic surgeon system, surgeons should soon be able to operate on the heart without stopping the beating. Conventional heart surgery is done with the patient placed on cardiovascular bypass, with a machine pump circulating the blood, while the heart sits idle for the convenience of the surgeon and the safety of the patient. Now George Mylonas of Imperial College London has developed motion compensation software that should allow the robotic surgeon to compensate for the motion of the beating heart, and operate on the organ without stopping it first. In traditional bypass surgery the heart is stopped and an artificial pump is used to keep blood flowing around the body. This is highly traumatic as it involves open heart surgery, and means the blood flow is re-routed through a machine. Alternatively, some surgeons now prefer the less drastic approach of slowing the heart down by cooling it. However, even when the heart beats more slowly it is still a moving target, says Rajesh Aggarwal, a surgeon and specialist in minimally invasive procedures at ICL, whose department has been working with Mylonas. "It's a difficult procedure on a stationary piece of tissue, let alone when it is moving," he says. The new system would allow the procedure to be carried out with the chest closed. The da Vinci robot uses a two-camera endoscope that feeds images to the surgeon's viewer. Images from the left and right cameras are fed to each of the surgeon's eyes separately, providing a 3D view of the tissue being operated on. Mylonas's system exploits this by fitting an infrared eye tracker to the viewer. This monitors each eye to detect precisely where the surgeon is looking, and then calculates the distance to the point their gaze is fixed upon using triangulation. The software first constructs a 3D model of the heart by tracking the surgeon's eyes as they move over the organ. Then it creates a real-time moving image by recording the changes in the surgeon's focal point as the heart beats. 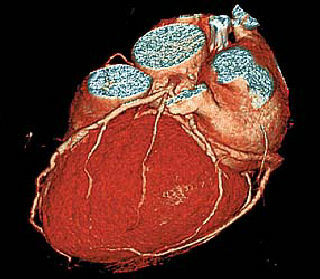 The endoscope is calibrated to move forwards and backwards in time with this image, after which the heart appears stationary to the surgeon viewing it through the two cameras. The surgical instruments are also calibrated to move in synchrony with the beating heart, removing the need to constantly move them back and forwards, and allowing the surgeon to concentrate on performing the operation.